Cold Creek Farm is a family owned venue, operated by Jeff and Susan Buffington. Located in the North Georgia mountains, it was originally purchased in 2011 to be a working farm with animals and all! A few years and a great deal of hard work later, it is now a place where love is celebrated almost every weekend of the year. Born and raised in the south, Jeff has grown up living life as a city fella from Marietta. After graduating from UGA in ’87, Jeff owned and worked for various companies in the corporate world. In 1998 Susan and her family moved to Georgia from northern Indiana. Growing up on her grandparent’s farm in a small mid-western town taught her all about country living. Currently Susan works in the public school system with special needs children while Jeff runs the venue full time with his office assistants Carla, and Kay. They handle Brides Services and Vendors Services, respectively. Fate brought Susan and Jeff together in 2009, and luck landed them at Cold Creek Farm in 2011. The road to this point has not been easy; but staying true to each other, with God’s guidance, pieces of their lives have fallen into place. Much work has been done at Cold Creek Farm; when the property was purchased it had been sitting vacant for over two years. Grading machines, fence building, construction expansion, and of course getting all the animals to their new home are just a few of the projects taken on. Not only do many different animals live at CCF, so do Susan, Jeff and a random hand full of the 9 kids they collectively have together. Their home just happens to be the upper level of the barn. Horses in the front pasture greet you on the drive in through the large front gate spelling out the property’s name. Oak trees, pine trees and a rolling hill stand as the backdrop for the barn. Inside the barn you will find a warm, rustic environment decorated especially for your event. 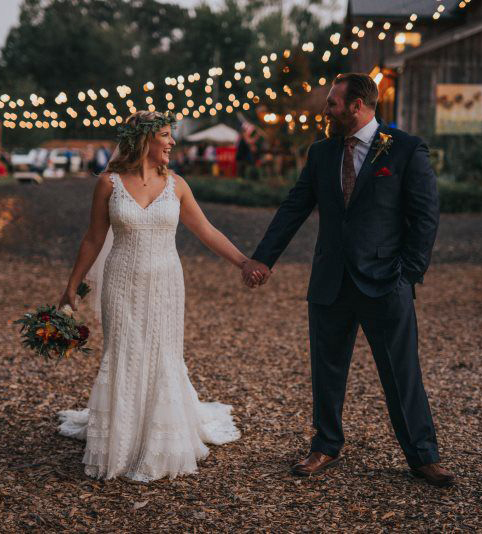 The ceremony space at the far end of the barn is the previous riding ring; now outfitted with a large white arbor that frames the space, and a rustic altar where you’ll say your vows. Cold Creek Farm is dedicated to sharing our beautiful venue in an atmosphere where guest feel the sense of His spirit while celebrating milestones in their lives. We are truly blessed to be the keepers of this land and it is an honor to be selected as your venue of choice to gather with your family, friends, or co-workers. It is our responsibility to maintain the most enjoyable, appealing, and safe location for your special event.